Many thanks to all of you who have volunteered to spend the Friday and Saturday of Memorial Day weekend distributing poppies at our four locations around the area. There is a late major change this year in that we will no longer man the Central Market in Mill Creek and instead will shift to the QFC at 196th and 76th on the Lynnwood / Edmonds line. We ask those of you who volunteered for Central Market to instead man the new QFC Lynnwood location. For those of you who have yet to volunteer, we can still use more help and feel free to bring family members along. 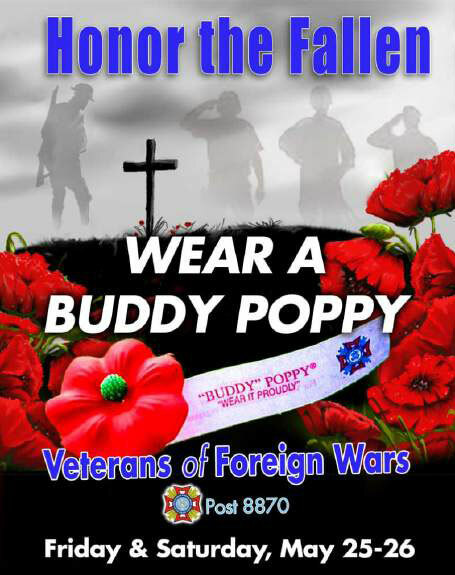 We will be accepting signups at the May Post meeting or you can contact our Poppy Committee Chair, Bob CrawfordL <bobcrawford33@hotmail.com> or your commander. Fred Meyer, 164th & Alderwood Mall Blvd. We are grateful to the Kroger organization for their generous support of VFW.